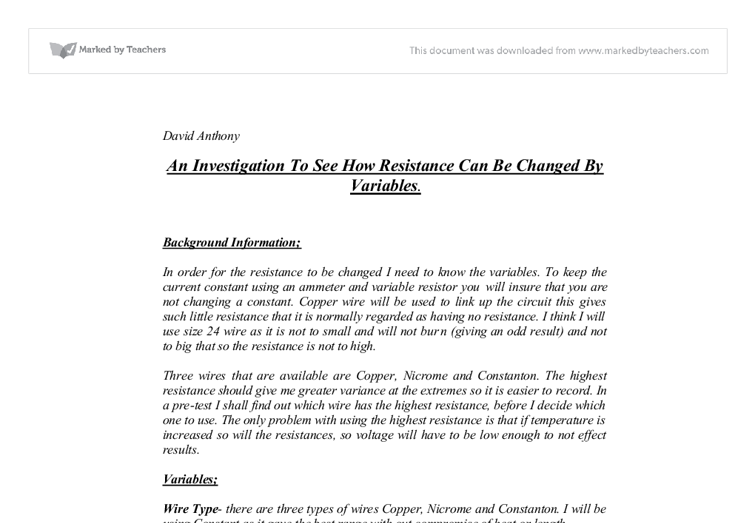 An Investigation To See How Resistance Can Be Changed By Variables. In order for the resistance to be changed I need to know the variables. To keep the current constant using an ammeter and variable resistor you will insure that you are not changing a constant. Copper wire will be used to link up the circuit this gives such little resistance that it is normally regarded as having no resistance. I think I will use size 24 wire as it is not to small and will not burn (giving an odd result) and not to big that so the resistance is not to high. Three wires that are available are Copper, Nicrome and Constanton. The highest resistance should give me greater variance at the extremes so it is easier to record. In a pre-test I shall find out which wire has the highest resistance, before I decide which one to use. 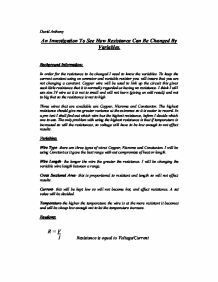 The only problem with using the highest resistance is that if temperature is increased so will the resistances, so voltage will have to be low enough to not effect results. Wire Type- there are three types of wires Copper, Nicrome and Constanton. I will be using Constant as it gave the best range with out compromise of heat or length. Wire Length- the longer the wire the greater the resistance. I will be changing the variable wire length between a range. Cross Sectional Area- this is proportional to resistant and length so will not effect results. Current- this will be kept low so will not become hot, and effect resistance. Varies, as it is the value testing. This is the table of variables all these will be carried out in the experiment to insure it is a fair and even test. Power pack- to insure there is a low current. Variable Resistor- for fine-tuning of the current so is stays the same. Wires- linking the circuit together made from copper. Crocodile clips- to go on the end of the wires to attach them selves firmly to the wire. Meter ruler- so measurements are accurate the wire will be stuck onto the stick so no stretching or weakness occurs when taking results. Masking tape- to attach the wire onto the ruler making sure you can reach the wire you are connecting the stick. Amp. Meter- to insure impute data is all of the same current level. I will be taking around three result for each lengths of the wire however if there is an anomalies the whole lengths for that go will be redone to make sure the readings are correct. Information collected in this experiment could be compared with data of other resistance of wires to see if the resistance or gradient of the line if graphs were drawn, was the same or if it was completely random from metal to metal. This would help decide how resistant the wire becomes and if extended the length and it discontinuation or continued. The other interesting things to continue with the experiment would be the connection of other alloys and their relationship with themselves, and heavier and lighter alloys of the same type. The data collected and compared would then be used to see how effective the alloy is at resistance and how far this resistance extents till it is all off one metal or the other. This extra work would make sure the length is constant for all wires, also comparing with alloys and their effect on the gradient would be noted on how much the compound changes the resistance. This work would make the information gather from this experiment valid and help find out the effect on changing the concentration of metals. The experiment followed the original prediction and with only a slight waver with length 0.7 meters the true vale was almost completely correct and could only be made clearer of error if more accurate measurement equipment was available. This is a well structured and well written report. 1. There is a running commentary in this report that needs to be removed. 2. The sources of information need to be referenced. 3. The conclusion needs to include data to back up the patterns. 4. The evaluation should suggest further research opportunities. using a voltmeter connected across (in parallel with) the components. The current flowing through a component in a circuit is measured in amperes (A) using an ammeter connected in series with the component. The resistance is a property of any object or substance of resisting or opposing the flow of an electrical current. As you can see there is an anomalous result of this may be due to misreading the thermometer or the measurements may be incorrect. All my results were interpreted on to graphs Analysis of results From the results of my experiment I drew graphs to show what had been obtained from the experiment more clearly. All of the numbers are given to two decimal places. Note: The calculations for these values will be explained later. Table #1: This table displays the three measurements of electrical energy taken each time the motor was run, and the weights it was required to lift. I also want to work out where any lost energy in the experiment has gone. The Preliminary Experiments: I have chosen to use a ping-pong ball to investigate. I chose a ping-pong ball for my investigation because after quickly testing each ball's bounce height, I found that its bounce height was most suitable for use with the equipment we had. As the length of the wire increases, so does the resistance. The graph shows that this obeys Ohm's law as it is a linear line and that it passes through the origin. This is generally what I expected to find for this part of my experiment. when the height is increased to 9cm the speed increases to 0.44 m/s. This also proves that 'the height of the ramp is proportional to the speed of the car', and an increase in height also produces an increase in speed.